Details about the Baldur's Gate Enhanced Edition are slowly bubbling to the surface. Yesterday's announcement of the Baldur's Gate Enhanced Edition was pretty much a gong show from the word "go." The reveal site crashed the moment the countdown timer hit zero, as we all knew it would, and when the official announcement did finally start making the rounds, it was nothing more than a title - Baldur's Gate Enhanced Edition! - and a launch quarter of summer 2012. Oh, and a picture of Sarevok. Fortunately, Trent Oster, the big hondo at BGEE studio Beamdog, has let a few more details slip by way of his personal Twitter account. 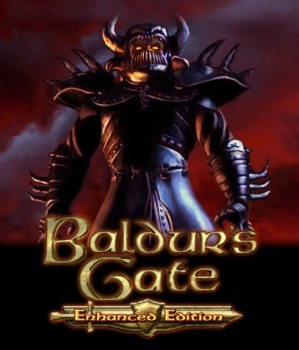 It turns out that there will actually be two games, BGEE and BG2EE, also known as the Baldur's Gate 2 Enhanced Edition. The first game will include the original Baldur's Gate plus the Tales of the Sword Coast expansion; BG2EE will include Baldur's Gate 2 plus the Throne of Bhaal expansion. It's the whole shebang, in other words, plus new content including new characters with new voice actors. But Oster also made it clear that all the important bits will remain untouched. All the original voice files are in the game, so everyone will sound like they're supposed to, and the game will be entirely isometric 2D. It will also continue to make use of the 2nd edition ruleset, as the original Baldur's Gate games did, and the music is being left as-is because it's already so epic. A few other details of note: The game is being built on the "Infinity Advanced" engine based on the last Throne of Bhaal build, meaning that all the enhancements from that game will be included in this one. It will be a digital-only release through Beamdog, although the studio is "putting some thought into" a Steam release as well, and while it's currently a PC exclusive, Oster hinted that other platforms could be announced next week. The studio is "trying hard not to break mods" and at this point the save game formats are the same, so you might even be able to make use of those old saves you've kept lying around for the past decade. You still have those, right? Imports from BG1 to BG2 will be supported, controllers will not be supported - this is mouse-and-keyboard only, as it should be - and if you want a truly authentic BioWare experience you can play with just the original content and ignore all the new stuff, although I think that'd be kind of silly. More details will presumably be forthcoming and Oster said some screenshots are on the way as well, hopefully next week, which I'm really looking forward to. We'll keep you posted!